First released in 2008, the RE-2 has undergone a revamp and a rebirth in 2009. 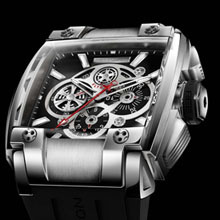 Award-winning watch designer Eric Giroud has re-examined and re-worked every detail of the case to emphasize its strength and power. The RE-2 now features Rebellion's distinctive signature helice screw heads, larger diameter crown  more masculine and easier to use  plus new wedge-shaped chronograph pushers that feel as good as they look. Even a quick glance at the RE-2 is enough to appreciate that this is not a watch to mess with. Natural rubber grips on the crown and slots in the pushers add both substance and style to the chronograph's already impressive functionality. The RE-2 demands respect and it gets it! The silky smooth operation of the pushers on a column-wheel chronograph has seduced many an aficionado of fine complications and this timepiece has been developed and designed to win both the hearts and minds of discerning collectors.